The Congress party on Monday saw support pouring in from a number of opposition parties across the country in its call for 'Bharat bandh' to protest against rising fuel prices in the country. While the Aam Aadmi Party (AAP) has joined the protests in Delhi, the MNS extended its support in Maharashtra. 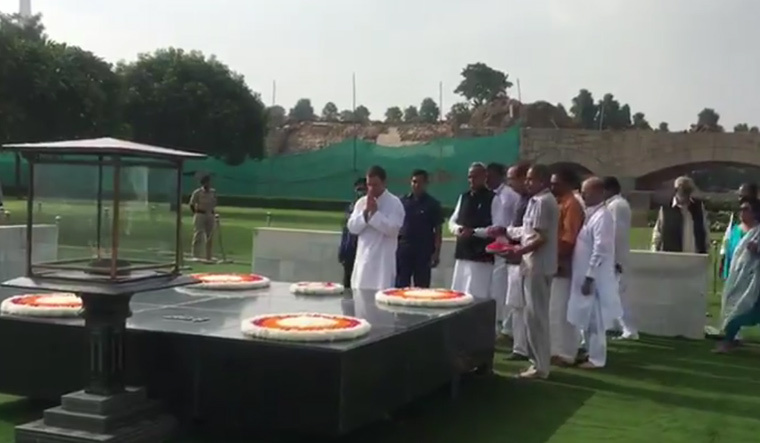 Congress President Rahul Gandhi led the protest from Rajghat by paying homage to Mahatma Gandhi. Most of the cities in the country wore a deserted look on Monday morning and normal life has taken a hit in the nation-wide shut down on Monday. The petrol, diesel prices have been sky-rocketing for the past two weeks. Petrol prices have hit Rs 80.73 and Rs 88.12 per litre in Delhi and Mumbai, respectively. Diesel is retailing at Rs 72.83 and Rs 77.32 in Delhi and Mumbai. Top opposition party leaders like Sharad Pawar, M.K. Stalin and the left leaders have openly extended their support for the call for shut down, while the Trinamool Congress has decided to stay away from the protest. Karnataka is witnessing a total shut down with schools in Bengaluru declaring a holiday on Monday. North Eastern Karnataka Road Transport Corporation (NEKRTC) has called off its bus services in the state. In Andhra Pradesh, early visuals showed the CPI and CPI(M) workers taking to the streets in Vijayawada hold protest against fuel price hike. In Telangana, Congress workers are holding protests in Hyderabad. In Bhubaneswar, too, opposition parties are on the streets against the fuel price hike. However, the ruling BJD has distanced itself from the protest. "The Biju Janata Dal (BJD) has been fighting against the price rise of petrol and deisel in the country and it is not for the first time that the country has seen such hike in fuel price. We are neither supporting nor opposing the Bharat bandh," spokesperson Sasmit Patra told news agency ANI. Even BJP-ruled states are witnessing protests. Protesters have hit the ground in Gujarat's Bharuch by burning tyres and stopping buses, and traffic movement halted. The workers of the Congress and the SP are out on the streets in Lucknow. Schools have been shut in Madhya Pradesh on account of the Bharat bandh. Maharashtra is the only state that is seeing the least support for Bharat bandh. While Shiv Sena, BJP's ally in Maharashtra, has stayed away from protests, the MNS party workers are protesting against the fuel price hikes. Interestingly, Mumbai is the city where fuel prices are the maximum in the country.